With our decade-and-a-half string of milder winters, a popular southern landscape plant has become increasingly prevalent in Kansas City landscapes. It’s the Nandina or Heavenly Bamboo (Nandina domestica). I will call it Nandina because it is not a bamboo and as for heavenly, you be the judge. 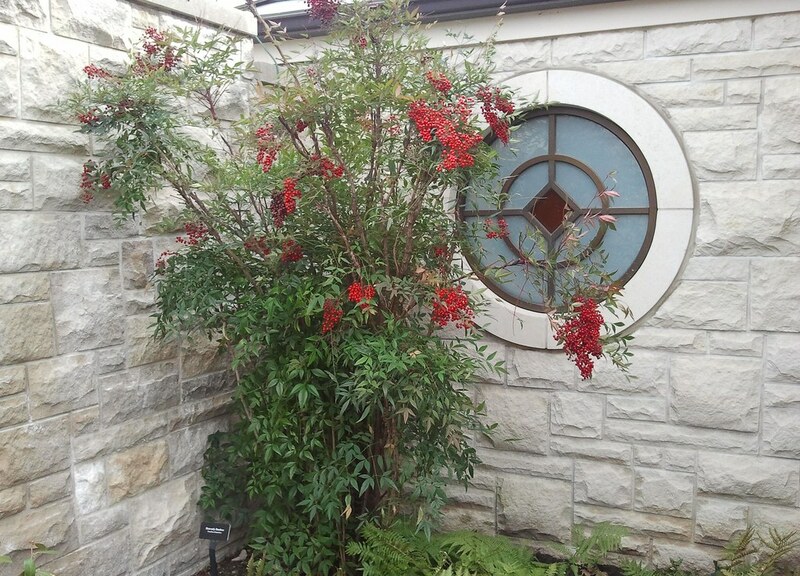 This Nandina is more than a decade old and growing within the sheltering walls of the Kauffman Memorial Garden. The walls are 8 feet tall so you can see how big some forms of this evergreen shrub can get. It is studded with beautiful clusters of red berries through the winter. 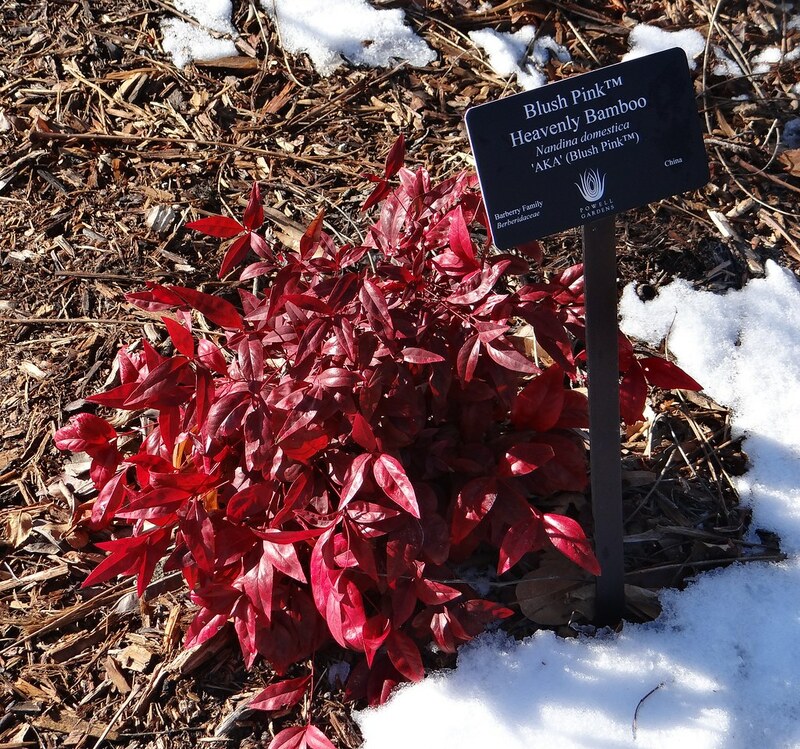 Nandina is native from India to Eastern Asia and generally not hardy if temperatures drop much below zero. A big plant like this one is a good indicator of at least a warm zone 6b climate. Nandina also comes in a white berried cultivar named ‘Leucocarpa’ or ‘Alba’ depending on your botanical reference. 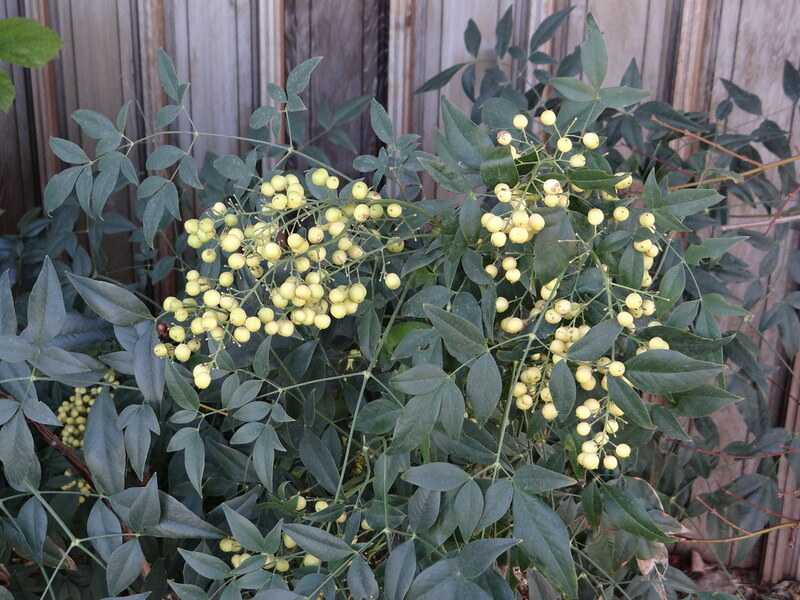 This White-berried Nandina has ivory white berries that can age to a caramel color if we have severe cold. This plant is growing in the north courtyard to the Visitor Education Center out at Powell Gardens where it has done well for more than a decade sheltered against the building and under its overhang. Its leaves have frozen off after a severe winter but it has always quickly recovered in spring. The flowers of Nandinas are not showy but rich in pollen and nectar and I enjoy watching and listening to the bumblebees that pollinate them. The bees do a sort of excited buzz at every flower they visit–each flower must have some real fine nectar! Unfortunately birds like the berries of Nandina and can spread the plant far and wide. So far that has not happened here but in Central Arkansas and south it is becoming an invasive shrub. We planted this Compact Nandina (‘Compacta’) below the deck off the east side of the Conservatory. Nandinas are incredibly shade tolerant and drought tolerant and this cultivar demonstrates that trait to a tee. The compact variety is supposed to stay lower than 4 feet but it is a tender cultivar. Ours burns to paper bag brown almost every winter (you can see some burn starting here and it’s only gotten down to single digits at best). It has been killed to the ground most years but does sprout up from the roots. It will flower and set fruit after a couple mild winters. I think we may replace these with a hardier cultivar of Nandina–I actually like them in this spot where almost nothing else will grow and Nandinas under the overhang of your home is a Japanese symbol of hospitality. 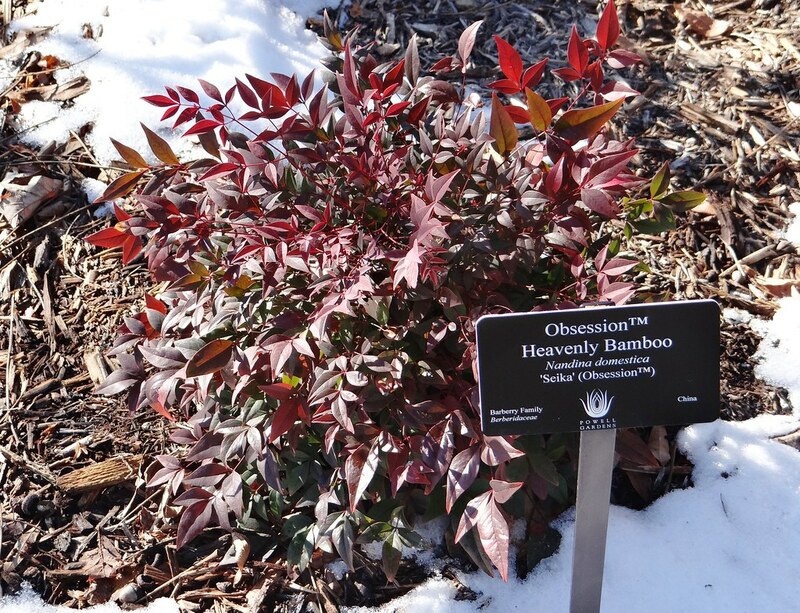 Many Nandinas turn purplish turns in winter. This is Flirt(TM) Nandina (‘Murasaki’) which flirts with lovely purplish leaf tones in winter but it also stays short and doesn’t flower. The advantage of Nandina not flowering is that this variety CANNOT become invasive. 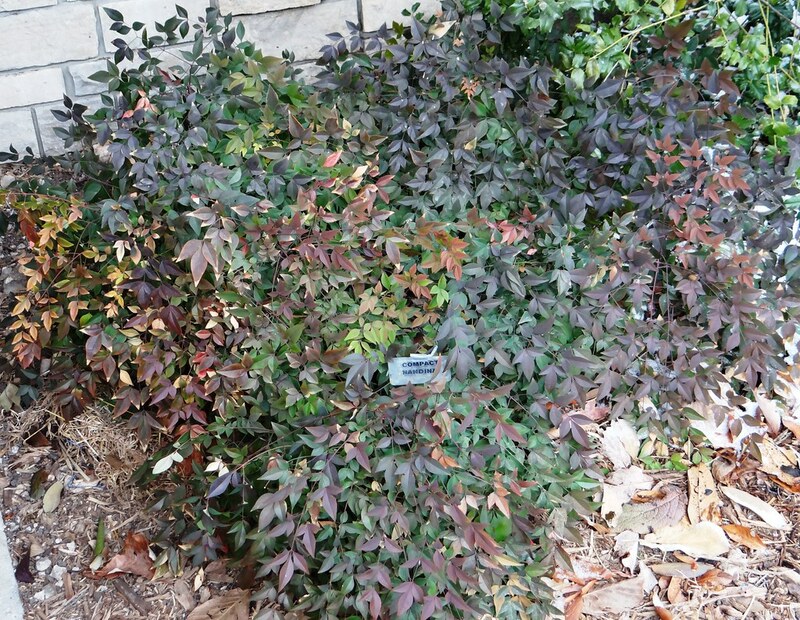 Here’s another dwarf, non-flowering cultivar with even more reddish winter leaves. You can see its label: Obsession(TM) Nandina (‘Seika’). Shocking that this is the same plant but in midsummer not midwinter! 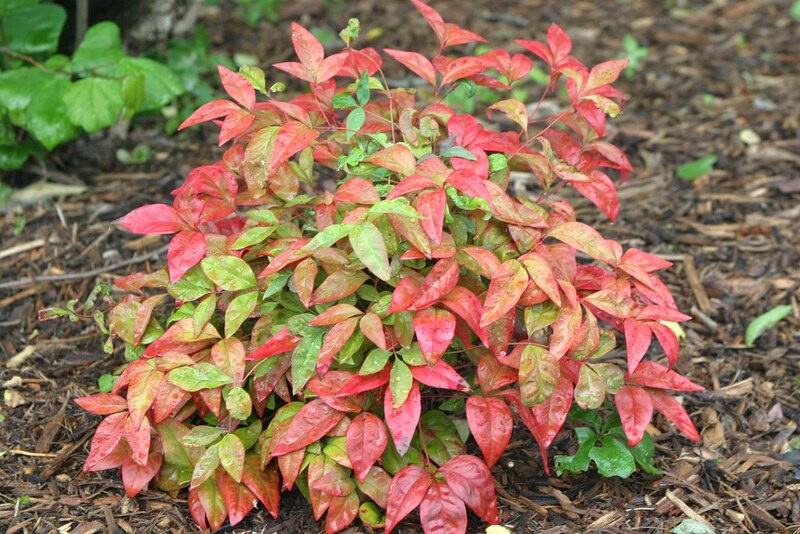 Now it makes sense how this Nandina got the trademarked name Blush Pink. These final three dwarf, non-flowering Nandinas are grown for their exquisite foliage. All three are part of the Southern Living Collection and have shown good hardiness with no leaf burn here at Powell Gardens. Visit www.southernliving.com to learn more about this collection of plants that thrive in our southern summertime heat.